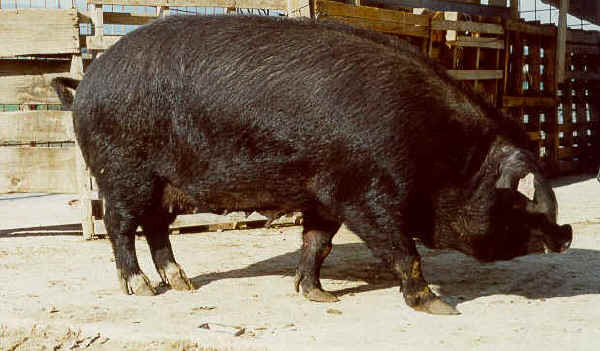 The origin of the Black Pig from Calabria is uncertain. There are two different hypotheses at present: according to one it would come from the Iberian stock, while the other from the Roman one. Once it used to be present in vast areas of Calabria and distinguished into several local varieties, like Reggitana, Cosentino, Orielese, Lagonegrese, Catanzarese, Casalinga and others. All these animals had the common characteristic of a good unfat meat ideal to the sausage production, typical of that area. The present day consistency is very limited: the real typical examples, or those that resemble the original type, are very few. They give lean cuts, ham and shoulders have quite good size. Medium-sized pigs with not entirely developed muscles but a solid bone structure. The limbs are not too long. The frontal nose profile is straight with medium-large leaning ears, which they bear forward. The main colour is black but sometimes some examples are spotted or have white socks.